When my friend Fidel Gomez, Jr. died suddenly this year at the relatively young age of 45, he left a terrible hole in my heart that, four months later, has barely begun to heal. He also left before we had any chance to argue the merits or lack thereof to The Dark Tower. Fidel was passionate about the Stephen King series and was thoroughly against everything connected to The Dark Tower: the casting, the length, everything. Try as I might I could not convince him to go see it. He didn't even want to see it in the second-run theaters, but unfortunately he died before it came out on DVD, where being a fan of Redbox, he might have finally have broken down to see it. When I lost Fidel, I not only lost one of my closest friends, but I lost someone who could explain all the intricacies of the epic Gunslinger mythos and what had been kept, what had been kept out, and what went wrong. I was wandering this world alone, and since he, this massive Dark Tower fan, is dead, I am more alone. The Dark Tower fails to do a lot of things. It fails to make those who haven't read this sprawling epic want to pick it up (almost to where they might want to avoid it). It fails, I figure, to make those who have read it (like my late friend Fidel) have their beloved epic come to life. So many things went wrong before the cameras started rolling that it's a wonder there's still talk of a television series or sequel given both how bad the film is and how poorly it was received. Jake Chambers (Tom Taylor) has been having dreams about another world. This world has a Gunslinger (Idris Elba) and a Man in Black (Matthew McConaughey), at war with each other. Jake also sees people with false skin to mask their otherworldly roots. His mother Laurie (Kathryn Winnick) and especially his stepfather Lon (Nicholas Pauling) don't see eye-to-eye on Jake. Laurie keeps pushing for him to get more therapy, convinced his dreams and visions are the result of dealing with Jake's father's death a year ago. Lon just wants to get rid of Jake. It's now that two people from a 'psychiatric hospital' have come to take Jake away for a weekend visit. In reality, Jake sees that they are skin-crawlers (or something like that: I forgot the exact name) and promptly flees. Fortunately, he's been altered to where a house he's seen in his dreams is at, goes there, and is transported into Mid-World, where he finally meets The Gunslinger. It's here that the Gunslinger reluctantly works with Jake against The Man in Black, who is after Jake because he believes Jake has to power to bring down The Dark Tower. The Dark Tower holds the various universes together, and if it is destroyed, The Man in Black can rule. It sounds more threatening than it is, especially after you learn that The Gunslinger's name is 'Roland' and The Man in Black's name is 'Walter'. Roland and Walter don't appear to be threatening names compared to The Gunslinger and The Man in Black, but I digress. Now, it is up to Jake and Roland to stop Walter while avoiding Walter's mad pursuit of them from Mid-World to 'Keystone Earth', where Jake is from. It's too late for Laurie and Lon, who were cut down by Walter, leaving Jake an orphan. No matter, I'm sure the Gunslinger could be an excellent father-figure, but it does require him to rescue Jake when Walter manages to track them down in New York City. Walter attempts to harness Jake's 'pure Shining' to bring down the Tower, but instead he makes contact with Roland, who manages to have one last confrontation with The Man in Black. Above all else when it comes to The Dark Tower, perhaps the most amazing element is that it took four people (Jeff Pinkner, Anders Thomas Jensen, Academy Award winner Akiva Goldman and director Nikolaj Arcel) to hammer out a film that runs around 90 minutes. For something as epic and sprawling as The Dark Tower series (eight books, I understand), to compress a lot into so little is an astonishing decision. The four credited screenwriters (and I suspect there were more hands on this project) threw a lot at us, giving hints of things that due to the running time simply could not be explored. There was Jake and The Gunslinger's visit to a village of seers, where Jake meets a pretty girl. He save her when Walter's minions attack, and I figure any potential romance would have been tackled in any sequel, but that aspect had to zip past us. As a side note, how was it that in a village full of seers who can see past and future, not one of them could see that Walter was coming? For a village of seers, they proved pretty inept. Just a thought. We learn through dialogue that Roland's gun is made from steel of the sword of Arthur Eld himself, a sword known on Keystone Earth as 'Excalibur'. I figure people with little to know knowledge of The Dark Tower would even imagine such a wild connection, and those who did know had to have a nod to it. That was pretty clunky to begin with, but the exposition dialogue informing us that Jake's father died in a fire was worse, as was the endless number of cliches The Dark Tower seemed determined to fall into. There's the 'special one' story. There's the 'accidentally overhearing important information' part. There are other parts that can't be explored due to time constraints, whole characters that don't appear important even if they are in the story. There's the aforementioned 'love interest', there's Jake's best friend Timmy (Michael Barbieri) who is there early on and never to be seen or heard from unless he has to give important information. There's a homeless man who warns Jake about how they are coming from other worlds, but when he's confronted later on by Jake and Roland, he seems to have no idea what they are going on about. There's Lon's perpetually hostile reaction towards his stepson, which is not only cliche but without any real explanation. There's Roland's 'fish-out-of-water' comedy bits that aren't funny. As a side note, that aspect reminds me of Percy Jackson & The Olympians: The Lightning Thief. It's a poor reflection on The Dark Tower when a Stephen King book reminds you of Rick Riordan. 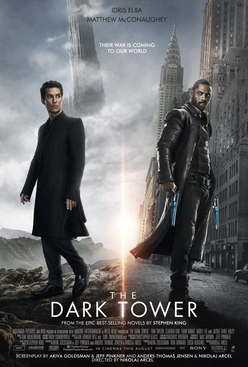 Whatever was good, whatever was special about The Dark Tower series got lost in what looks like a strange effort to make this into a young-adult franchise. It's all a shame because Idris Elba showed himself to be perfect for the conflicted, weary Gunslinger. The failure of the film is nowhere near his fault. In fact, he's about the only aspect of worth in The Dark Tower, a film that does him a terrible injustice by popping his wonderful performance in such lousy material. McConaughey appears to be having a ball camping it up for all his paycheck's worth. Taylor, I think, did his best but it is surprising that The Dark Tower opted to make him the central character when Elba and The Gunslinger would have made for more interesting viewing. This is especially true when it takes nearly a half hour for them to meet. If you are going to make a relatively short film, using a third of your time for a domestic drama with barely hints of the epic multiverse battles going on might not be the best decision. Some things in The Dark Tower are almost beyond belief. When Jake is making his escape, he looks like a parkour master. The Gunslinger and Jake are attacked twice in one night by some kind of monsters that can tap into their psyches and form images of their late fathers, but who they are or whether they are in league with Walter is left up in the air. I figure that both The Gunslinger and Jake having lost their fathers is or will be connected in some way, but I guess we'll never explore that parallel. Just about everything in The Dark Tower is a misfire: the music that tries to do the heavy lifting, McConaughey's performance, a boring final battle, a story that cannot ground itself (and having four people write this seems too hard to believe). Idris Elba should be proud of his work, because he put real effort into it. It also cries out for someone to put him in a legitimate Western or just to have him work more. I do wish my friend Fidel Gomez, Jr. were alive for a myriad of reasons. I'm sure he, a big Dark Tower fan, would have disliked The Dark Tower intensely, but it would have been so much fun laughing about it all.